Apple revealed a second-generation model of its AirPods this week, along with a Wireless Charging Case, but while most of the audio attention has been on Apple's wearable device, Beats is said to be gearing up its own attempt at the wire-free accessories. A version of the Beats PowerBeats that lacks the cord connecting the two earphone sections together is apparently close to launch, according to a retail channel source of CNET. The product, likely to retain the PowerBeats name, will allegedly be announced sometime in April, though it is unclear when it will take place. Pricing for the accessories is unknown, but it is likely to be in line with other similar products, such as the PowerBeats3 priced at $200. That model has been spotted at lower price points at some retailers, which may be a sign a replacement premium-end model will be shipping soon. There is also no word on what the design of the earphones will be like, except for the lack of wiring. 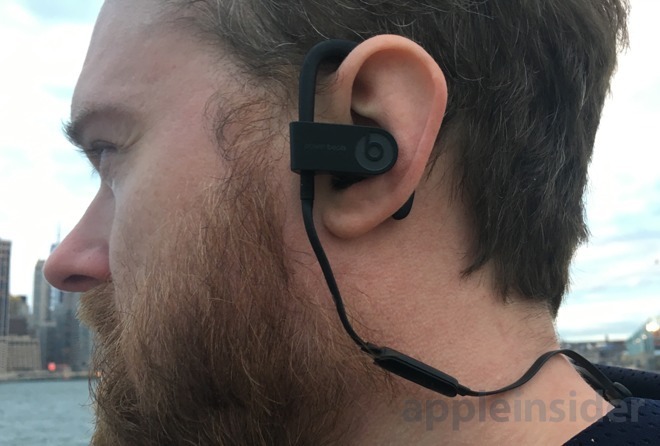 One possible design is that it could look like the current PowerBeats3, complete with over-ear clip, making it an alternative to AirPods for those who use them while active, minimizing the risk of the earphones being dislodged or damaged during exercise. It is highly likely the product will borrow most of the technology used by the new AirPods, including the H1 wireless chip. Replacing the W1 wireless chip, the H1 is designed for headphone usage, offering performance and connection improvements, longer battery life, and enables hands-free "Hey Siri."